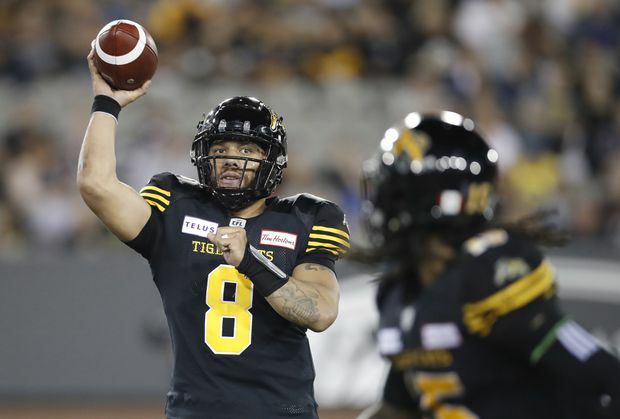 Hamilton Tiger-Cats quarterback Jeremiah Masoli passes the ball against the Edmonton Eskimos during the second half of a game in Hamilton, Ont., on Aug. 23, 2018. Sinopoli posted a record-setting campaign with Ottawa. The 30-year-old native of Peterborough, Ont., had a league-high 116 catches – a single-season record for a Canadian – with 1,376 yards and four TDs and was a finalist to Harris last year.